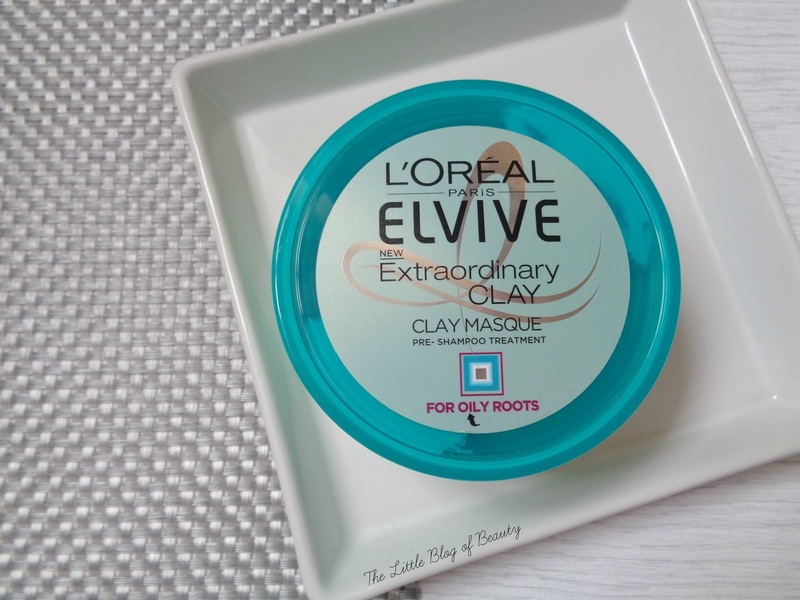 When I saw a promotional image for L'Oreal Elvive's new Extraordinary Clay range I was definitely intrigued. Clay in haircare? 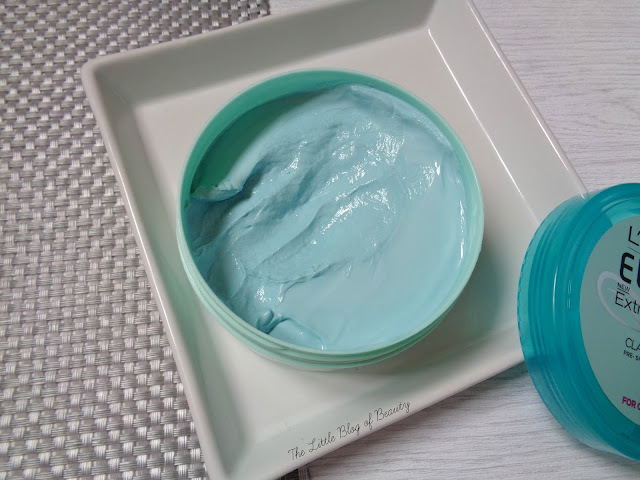 Of course we're all used to clay masks for oily or congested skin, but the thought of putting any kind of clay in your hair made me think you might end up with a rather matted mess. I've been fighting a lifelong battle with my oily hair and I don't think I've ever found a product that does actually help me go longer between washes. My hair does naturally change slightly, sometimes it barely lasts a day but other times if I'm really lucky I might get three days, but products rarely make any difference. The range consists of a pre-shampoo treatment masque, shampoo, conditioner and dry shampoo. The shampoo isn't colour protecting and although I haven't actually checked I assume it does contain sulphates, so I probably won't be giving that a try (at least while I'm still red anyway). I haven't really thought about trying the conditioner yet but actually it might be a good one for me to try as I'm always concerned about using too much conditioner or not rinsing it out properly and being left with oily hair straight after washing. The one I was really interested in though was the pre-shampoo treatment masque. I have also just bought the dry shampoo but haven't tried that yet so a review will follow in the future. The reason the pre-shampoo treatment appealed to me is because I always shampoo twice when I wash my hair. The first time to remove any surface dirt and oil so the second shampoo can get down to actually clean my hair. If you find the shampoo you're using doesn't lather up very well I'd recommend trying shampooing twice as I always find that even sulphate free shampoos lather up much better the second time once the surface dirt has been removed from the hair. So I thought the pre-shampoo masque might work well as my 'first shampoo' and then I'd only actually need to shampoo my hair once. The masque is far from solid but is really quite thick and you do have to stick your fingers right in there to scoop some out. It has a menthol kind of smell to it and is blue and will dye your fingers blue, although this does wash off easily. The idea is you apply the masque to the roots of your hair and scalp and leave for 10 minutes before shampooing as usual. As the mask is so thick I like to rub a little between my fingers first before attempting to apply it to my hair to try and thin it down a little. This isn't really the easiest product to apply because as soon as it gets close to your hair it sticks in place making it difficult to try and get through your hair towards your scalp. I guess you should try and apply it all over your scalp but I mostly concentrate of the parts of my hair that get the oiliest, around my face and down behind my ears. When you leave this for 10 minutes it will harden like a traditional clay face mask, which does feel a little strange in your hair, but once you start to rinse and shampoo your hair it does come out reasonably easily. So have I noticed a difference? Actually yes, I think I have. Nothing ground breaking, I don't think I'm anywhere near being able to go 4/5+ days without washing my hair, but I think I have seen an improvement. I think it does still depend on how my hair decides it wants to behave though. If it really wants to get oily than it probably still will, but the first time I used this I definitely got a little longer out of my hair. I've never been a dry shampoo fan at all but I'm looking forward to trying the one from this range out and am hoping for good things. I'll let you know how I get on soon. Have you tried anything from the Extraordinary Clay range? This range sounds well worth it, need to try it out! I don't really have oily roots so I'm not sure how this would work out for me but I am currently trying out the dry shampoo from this range, which is really good! I would be so tempted to apply it all over and let it get all the oil out! Luckily for me, my hair can last about 3-4 days before it needs to be washed *smug face* Glad you've found a product that works for you!